Haynesworth Passes Fitness Test! 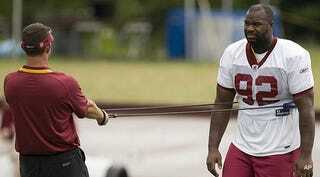 Haynesworth Passes Fitness Test! • The University of Miami is being investigated by the NCAA for recruiting-related text messages by coaches in various sports — including football, women's track and possibly baseball, three sources told [The Miami Herald]. Tennessee, too. [Yahoo]. • And now, from the Hickey's Biased Coverage Files ... The Braves lead the NL East by one game while Howard and Utley should be back for the second-place team soon. Mark Prior still wants to pitch in the bigs. Hickey's Weekend Guarantee: No dong pictures unless someone can produce a legitimate, autographed print of David Eckstein playing a game of "Compare and Contrast" with Dikembe Mutombo. What? You'd look. Everybody would look.